The very idea of leaving the security of your home to “bug out” to the woods has never sat well with me – In nearly every instance it’s better to hunker down or “bug in” than to bug out. I mean, why leave the safety and familiar surroundings of your home, for the open and unforgiving wilderness. For many people this is their first line of preparation against disaster, unfortunately, most will end up joining the multitude of other refugees freezing in a cave and eventually end up dead or wards of whatever government is still functioning. I live in a fairly safe area and have prepared to survive at home and can conceive of only a few scenarios that would force me to leave. Even then, I would go to an out-of-state relatives house with whom, I have a pre-arranged agreement, where if need be he can come to my place or I to his after a disaster. I know what you’re thinking “what about an end of the world as we know it” type event, well if such an event were to take place, there would be no 100% safe place for most of us, and really do you think you would be better of making a go of it in the open wilderness as opposed to hunkering down at home. Don’t get me wrong, I’m not saying we should never bug out to the wilderness; we should indeed keep all our options open, what I am saying is that there are better ways to survive most disasters than heading into the bush. Relying on emotion instead of logic can make for some interesting adventures; however without sound planning beforehand those adventures are likely to be sort lived. For example, I recently asked a fellow in his late 30’s what he would do if disaster struck his area. He thought for a moment and said he would gather his family and all the food, guns and ammunition he could find and head for the mountains that lay some seventy-five miles to the north of his home. Depending on the type of disaster, his “plan” might work short term for a lone survivor or a small group of individuals in good physical condition with proper gear and mind-set. But he is a new father and his wife is one of those that think missing an appointment at the nail-salon is the end of the world as she knows it. Making matters worse he has no outdoor survival training or skills other than watching reruns of Less Stroud’s “Survivorman” and camping at a national park campground with all the utilities and hookups. Why he thinks he can survive off the wilderness while dragging his family along, I don’t know. He isn’t thinking logically. His decision was based on emotion and as a result if he ever has to put his plan to the test in the real world his family will likely suffer or die because of his decision and “Red Dawn” thinking. Unfortunately, this batman in the boondocks mentality is and will continue to be the chosen survival plan for many who haven’t thought it through. When making survival plans for your family you have to honestly weigh the risks of your decision based on logic. In almost every disaster scenario, it is better to stay put (bugging in) or head to a pre-arranged safe place at an out-of-town relatives or friends house than it is to head to the woods to eat twigs and pine bark. For most people an evacuation bag is a better choice than a bug out bag. 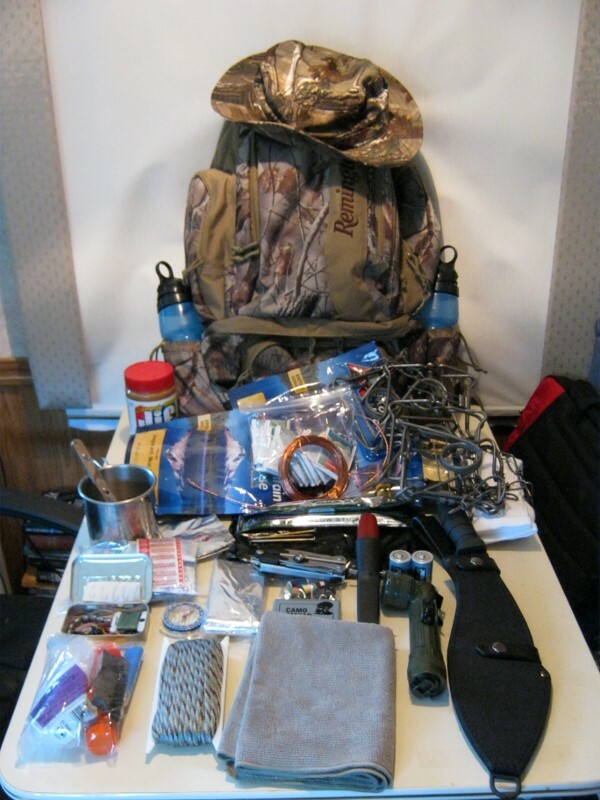 An evacuation bag should contain the gear necessary to get you from point A to point B, whereas a bug out bag (in most cases) is geared more toward wilderness survival. I have both, but admittedly my bug out bag is an option of last resort. Knowing when to go is much more important than the contents of your survival pack or even where you will go. You don’t want to jump and run before you need too, but you don’t want to wait too long or you may never reach your destination. If you wait for the authorities to give the order to evacuate it may already be too late. The roads leading to safety could be blocked and impassable by motor vehicle and walking to your destination may be impossible or too dangerous to attempt. On the other hand if you jump and run in response to every potential disaster you’ll soon deplete your resources and the patience of your family, school and employers.For example, say you live in an area prone to tornadoes like Texas and you evacuate to Arkansas every time the clouds turn dark or the wind shakes the leaves. You would literally stay on the road. But waiting until the twister is at your door will put you at an unnecessary risk. There are no easy answers; all you can do is weigh the dangers of bugging out vs. hunkering down depending on the situation and logic. You have to consider the nature of the threat and ask yourself which gives the best chance of survival with regards to the type of disaster you are facing. On the other hand let’s say there is snow storm heading your way and you have food, water, heat and a way to cook even if the power goes out for an extended amount of time then you are probably better off to hunker down where you are. In my opinion the bugging out vs. hunkering down debate is moot because it all comes down to the type of threat, your personal situation and preparedness level – in the end you’ll have to make that decision based on that knowledge and common sense.